What is a Laser Measuring Tool? Also known as electronic tape measure, a laser measuring tool is a meter that sends a pulse of laser light to an intended target with the purpose of measuring the time it takes for the reflection to come back. The onboard processing enables the laser to add, subtract, calculate areas and volumes, as well as triangulate. A laser measure is a vital device for people working in construction and in real estate industry making the measuring tasks simpler and faster. It helps in taking accurate measurements of the distance between walls, the area of a room, and even the volume without much hassle. In comparison to the traditional methods like dial gauge and stones, many benefits come with laser measuring tool making it worth investing in such device. The laser measuring tool is used to measure multiple units of measure. In order to use this tool, you simply flip through the various units till you get the desired unit you intend to measure and then begin to take the measurements. These tools can also be placed against a wall to measure from the back of the unit in order to get the correct wall to wall distance measurement. You can do the same to ceiling measurements by laying the tool on the backside while pointing it up to get the distance between the floor and the ceiling. The laser measuring tools are truly accurate and time savers. When it is about measuring distance and various measurements in a construction site, you will need the best laser measuring tool. This is because the best laser will allow you ease of usage; offer you a variety of impressive features while feeding you with the most accurate results after every measurement. The best laser is not only convenient to use but also versatile and long-lasting. 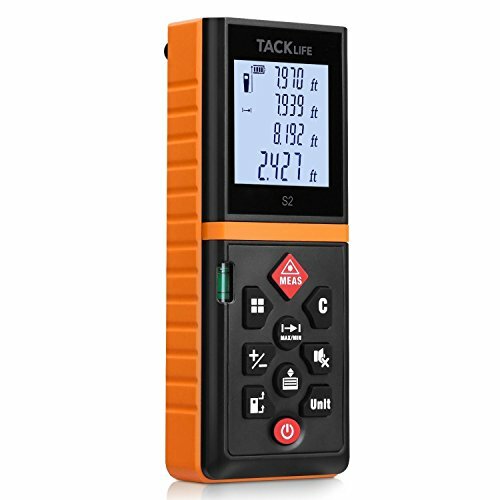 The Tacklife HD60 is a classic laser measuring device that features IP54 waterproof level that protects the laser distance measure normally to the maximum extent. In addition to this, it is designed with versatile functions for high accuracy. It comes with 2 bubble levels that provide accurate measurement compared to one bubble. Its measuring range is 196Ft with a remarkable accuracy of ±1/16 Inch. It is ergonomically designed to fit in hand perfectly to give you convenient during operation. The Leica DISTO D2 features fully integrated with Bluetooth and a bright white LCD display. It offers the ability to take straight line measurements along with calculations that greatly enhance workflow. The Leica Disto D2 features a precision of 1/16 inch and measures up to 330 ft. It also comes with an ergonomic design with a soft-touch coating that offers a soft and comfortable grip in your hand. Its user-friendly operating interface allows you to use the device by a press of a button. The D2 features a Pythagoras function for indirect height or width measurements. 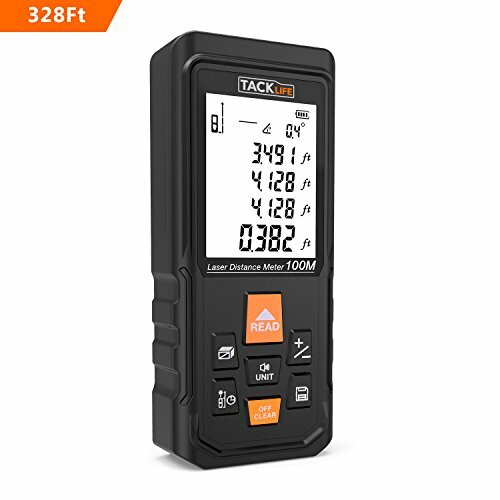 The TACKLIFE S3 100 is a highly accurate laser distance meter that can take measurements of up to 328ft. Besides, it can calculate area, distance, angle, and volume automatically. With a high accuracy of ±1/16 inch, you will be certain to get the most accurate measurements with this laser. The large backlit display will allow you to take readings even in poorly lit environments easily and clearly. Its dust and waterproof hence can work even in severe weather conditions. With FDA/CE/RoHS certification, it is safe and eco-friendly and can be suitable for use at home, construction and even in industries, such as large buildings, real estates, warehouses, and factories. Large Backlit Display: It is equipped with a larger backlit display compared to others. The Bosch blaze Pro GLM165-40 is a fully featured but simple to use laser measure. 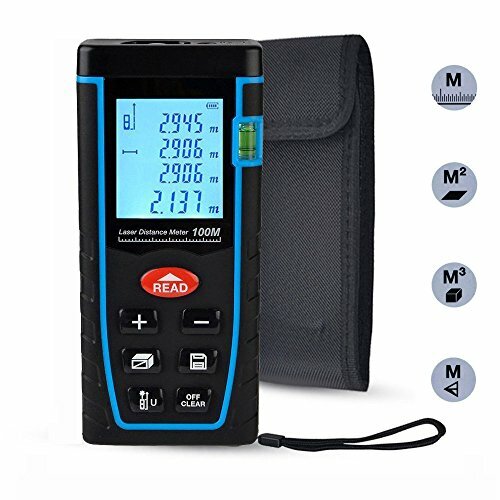 It comes with an easy to read backlit display that lights up the measurements delivered in real-time I terms of distance, area, volume or other indirect measuring functions. Besides, it can store up to 10 groups of measurements. It’s equipped with laser accuracy technology and real-time measurement mode for prompt and reliable measurements of up to 165 feet. Equipped with laser precision technology, the Digital Laser Distance measures accurately measurements of up to 131 feet. It can also quickly calculate distance, square, volume, and indirectly measure area. All the results are displayed on the backlit LCD display. Retrieval of previously recorded measurements is simplified with the intelligent design that makes it possible to check up to 20 previously recorded measurements. The laser is backed with a 12-months warranty. The Bosch GLM 20 is a one-button designed operation machine. 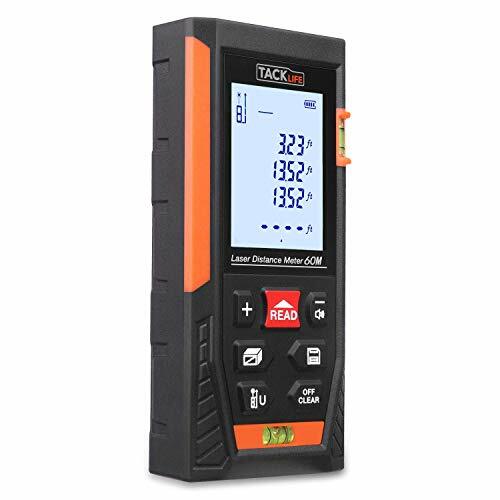 This makes it one of the easiest laser measure to use.This laser can measure up to 65 feet for various applications in a small job site area such as measuring wall prior to painting. With its square base, this laser can effectively stand on its own, as you adjust and move other tools minus touching the laser measure. The Laser distance measure ieGreek is designed with ease of use in mind. With just a press on the ready button to activate that laser, you are ready to start real-time measuring. The backlit display allows for the reading of records even in dark areas with excellent resolution. With a handy pocket design, you can use it wherever you go. Its self-calibration makes sure the accuracy of the laser is maintained and the adjusting range is -9 to 9 mm. It also features a good memory to store up to 30 data groups with a recall function. High Accuracy: A wide measuring range from 0.05 to 100m with a high precision measuring +/-2mm. 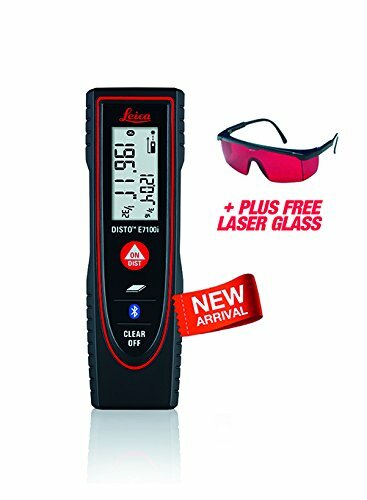 Leica DISTO E7100i features a class II laser with impeccable Leica DISTP laser measure equipment with 1/16 inch precision at 200 feet measuring range. This laser provides reliable and durable records even in diagonal rooms. The area mode offers the distance measure of square or rectangle in two shots. The third vertical shot is added by the volume mode. The Bluetooth technology assists to directly transferring measurements into the device apps. Featuring high precision and wide measuring range of up to 40m, this laser can quickly measure distance, volume, and area with one-button operation. After reading through this article, you should be in a position to know which laser measure to purchase. The factors that can always guide you to the best laser measures are accuracy, durability, range, measuring modes among others. However, with the many models in the market, do not allow yourself to be easily confused with many insignificant features, just focus on the essential ones first. 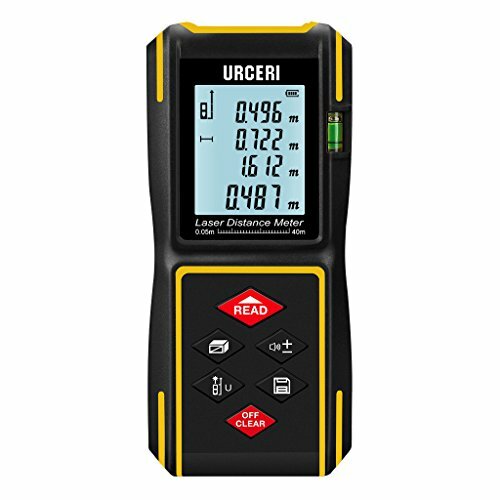 Purchase the best laser measuring tool and enjoy reading accurate measurement all the time.